Without a doubt, “Downton Abbey” has become one of the most popular series on public television. First appearing in the United Kingdom in 2010, the series made its American debut on PBS the following year and became an immediate hit. Season five is now underway. Much like “Upstairs, Downstairs,” the plot focuses on an aristocratic family and its staff. Set at a fictional estate in Yorkshire, the day-to-day life of the Crawley family unfolds during the early years of the past century. What makes “Downton Abbey” so fascinating is its attention to detail. The various duties of staff members such as the footman, lady’s maid, housekeeper and groundsman, and what each is expected to accomplish with “effortless dignity, finesse and pride,” are detailed. These tasks include how to set a proper table, put together a proper tea tray and even how to leave a room quietly in order to be as unobtrusive as possible. This little handbook provides guidelines for the staff so the estate will function flawlessly. From the cleaning and storing of fine silver to the preparations for hosting Their Majesties the King and Queen or other members of the Royal Family, this little guide provides an inside glimpse of the intricate workings of a grand estate in Britain a century ago. 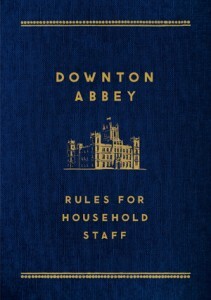 Although there is no actual “Downton Abbey,” this guide is based on authentic manuals from the period. The hierarchy of Lord and Lady Grantham’s staff underscores the necessity of order and organization to ensure that the running of such a large estate goes as smoothly as possible. This is a fun guide and documents almost every aspect of working downstairs in a grand estate during the Victorian and Edwardian eras.